— Desiring to be great is not bad at all. We are all wired to be great. Jesus does not discourage our striving to be great. Jesus re-directs our striving by saying whoever is the best servant is greatest. So go ahead, do your best to be number one. This is the fifth sermon for Rick Warren’s 40 Days of Love Campaign. Love is not self-seeking. That is what we read in the Bible. But what about our God given desire to be great? Deep inside all of us is a desire to be significant, to be important, to be the very best. Even the Apostles of Jesus had this desire. Often in the church, people get the idea that in order to be a good follower of Jesus you have to be meek and mild and pretend like you don’t desire to be great. We pastors have a special technical term for this idea. It is called Stinkin’ Thinkin’. If you think a desire for greatness is something that good Christians should not have, you are wrong according to our Lord Jesus. This is a myth, and this myth is busted! In fact, Jesus encourages the disciples to become great! Jesus says this to us, “whoever wants to become great among you must be your servant.” Jesus doesn’t say, “Don’t try to be the greatest.” Jesus simply teaches us what true greatness is and tells us to go for it! Love, is the greatest and first job we have according to Jesus. Jesus wants us to excel at it! Love is not self-serving but rather serves others. If you want to be a great lover, and experience the best, most fulfilling life you could ever live, you need to strive to be the greatest servant you can be. This Lent, we have been working through Rick Warren’s 40 Days of Love campaign with sermons and small groups. The goal is for us to understand the single most important thing in the universe: Love. If you were not able to join a small group for this event, you can still see all the lessons for free on YouTube. It is worth a look. I promise it will be infinitely more rewarding than watching funny cat videos. So far, in the past four weeks we explored key insights that God wants us to understand about Love. First, God wants us to love with the same kind of love self-sacrificial love that Jesus has for us. Second, Busyness in our life is the enemy of Love. Third, loving like Jesus is impossible without tapping into God’s supernatural help. Fourth, Real love requires God’s perfect judgment. We are called to discern and test all things, not to place final judgement on people’s thoughts and motivations. Today, we look at a fifth insight about love that God wants us to know. Great love requires great service. Think of the most loving people you can imagine? Names that come to mind might be mother Theresa, Dorothy Day, Mahatma Ghandi, Martin Luther King Junior. These were ambitious, but humble servants of others. Service of others is really just love in action. If we want to please God, and experience fulfilling relationships, me must love God and love others. Those are the greatest commandments, Jesus tells us in Mathew chapter 22. Real love in action is service of others. God wants us to excel at this. He doesn’t want us to be mediocre or half-hearted here. In fact, Jesus wants us to try hard to be the number one best servant of others on the planet! It is not a problem to be ambitious here. “13 “You are the salt of the earth; but if salt has lost its taste, how can its saltiness be restored? It is no longer good for anything, but is thrown out and trampled underfoot. Our saltiness or brightness in this world is shown by our love for God and others. Jesus doesn’t speak highly of those who are not salty or bright. It is very important to God that we actively love others all around us. You might be familiar with the song “They will know we are Christians by our Love.” The most obvious way to practice love is by selflessly serving others. Serving other people means all people that are around us, not only our family and friends. We expect to serve and be served by our own people. Even wicked people serve their family and friends. 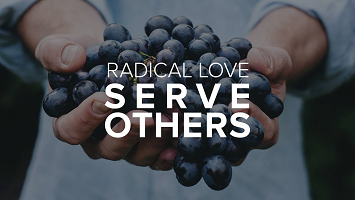 But the most visible love is love practiced by serving people who are not “our people.” That is why it takes ambition and effort to serve others in a way that the world can see. Let us take a moment to drill down into the idea of selflessly serving others for a moment. What really is service of others? Simply put, service of others is meeting the needs of another person. Service of others is not doing nice things for others merely to fulfill your own need to be useful and noticed. Others’ needs can be physical, mental, or emotional. Physical needs are things like clothes, food, money, and shelter. Mental needs are things like knowledge, awareness, instruction, and clear boundaries. Emotional needs are things like safety, security, companionship, and significance. Let me share a quick example. Let’s say a young couple in a congregation has triplets. Several people in the community are moved by their plight and start a meal baby page for the new family. The only problem is they don’t ask the family what they really need. People start showing up dropping off multiple meals every day. But, the couple loves to cook and it is one of the few things that get them through the long days of crying infants. And so they wind up receiving meals and cooking meals. There is way too much food and a lot of it goes to waste. This is not a good example of meeting other people’s needs. Real servants let the people they serve tell them what they need. It is hard work to serve people well. Service like this requires drive and passion. Service like this requires ambition. Service like this requires faith. How can we possibly love like this? We can lovingly and selflessly serve others by getting rid of stinkin’ thinkin’ that keeps us back from being motivated to serve selflessly. I am going to attempt to help by busting three more myths about service that keep us from striving to be the greatest servants in the world. Myth number 1: There is no way we can compete with others who are naturally more selfless and helpful than we are. This is not true. In fact, service of others is an individual sport. The proof is made plain in Romans 12:3, “3 For by the grace given me I say to every one of you: Do not think of yourself more highly than you ought, but rather think of yourself with sober judgment, in accordance with the faith God has distributed to each of you.” In other words, when it comes to serving others, we can all compete. It is like Golf. You get a handicap. You are ranked according to the ability to serve given to you by the Holy Spirit. So it is actually possible for someone who has few spiritual gifts to be better at serving others than someone with many spiritual gifts! You can compare yourself to others all you want if it is helpful, but not if it de-motivates you! The myth is busted, every person can compete to be the greatest servant, so try to be the best! Myth number 2: Being ambitious in serving others will make me arrogant or a checklist person, who doesn’t really care about people. This is not true. If we are truly being selfless servants, we will be meeting other people’s needs to be important, and to be in relationship. This kind of service actually makes us humble, and makes us slow down and listen to what people are saying they need. Someone who is simply executing helpful tasks as fast as possible is not serving well. Additionally, Paul debunks this myth in our scripture this morning by encouraging us to “outdo one another in showing honor. 11 Do not lag in zeal, be ardent in spirit, serve the Lord.” You see, serving others shows honor to others more than to oneself. In addition, God is another person. When we are ambitious in serving others, we study the Bible and listen for God’s Word. That makes us love others because we realize how much God loves us. The myth is busted. Being ambitious in serving others will make a person humble and caring if they are truly serving selflessly. Myth number 3: If I focus on being the best servant of others, I will neglect my own needs. Tom Holladay does a great job proving this myth false in his book “The Relationship Principles of Jesus.” That is the book 40 days of Love is based on. In fact, Holladay says that the opposite is true. As we seek to serve God and serve others selflessly, we actually meet our needs in better ways than if we only focused on ourselves. His argument is based on this idea: As we work hard to humbly serve God and Serve others, we actually start to have less and less felt needs! We become comfortable being either first OR last, and letting God use us wherever we might end up. If instead, we focus on our needs, it is a never ending cycle, because it simply magnifies our needs. They continue to grow faster than we can meet them. The only person who can truly fill our deepest needs is God. And God promises to do so even as we seek His kingdom by being loving, selfless servants. The myth is busted. Focusing and working selflessly on the needs of others is actually the best way to meet our own needs. It is not neglectful. I hope debunking these myths about serving others, has identified some stinkin’ thinkin’ in your minds that might have kept you focused on your own needs. I hope that preaching this sermon removes some of these same blocks in my own mind that keep me focused on my own needs as well. Love requires action. This action is serving others, for no other reason than to meet their needs. This is a radical concept! The others must not only include our friends and family, but also people who are not “our people.” In this ambition is allowed, even needed. This is because Jesus wants us to be great. After all, we are all made in the image of God, and God is great! So go ahead, try to be the number one best servant on the planet. See what happens. I believe, your loving relationships will increase, and you will be more filled up than you ever experienced in your life! If you want to be a great lover, great service is required.